Click to download and print the checklist. A checklist for planning the wedding is a valuable tool. It's a good idea to pull together a wedding ceremony and reception with a wedding checklist. This will keep all wedding tasks on track and help the bride and groom stay organized. The sample planning checklist provided here can be accessed by selecting the image above affiliated with this article. Once accessed, the document can be edited or changed to suit your needs. Click on it to download the printable PDF. If you do not have a PDF viewer, download the free Adobe Reader program. Once the checklist is downloaded, you can edit and save it to your computer. This checklist is intended to be used as a starting point for your planning and, as such, may not contain all of the unique elements that you have chosen to include in your wedding. Additionally, you may have chosen to not include some elements in your wedding. 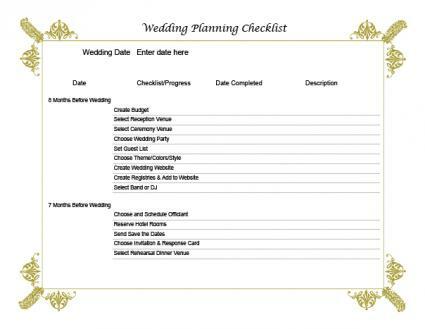 This sample checklist can be edited to suit your needs, so simply delete those items that are not applicable to your situation and add those that are unique to your planning. Most wedding experts agree that the early planning stages of a wedding last from at least eight months, if not further out, to four months prior to a wedding. This does not mean that you cannot have a short engagement and still plan a complete wedding, but rather that you will need to work more quickly in your planning than a couple who has more planning time. Budget: The budget will be used to plan individual elements in your wedding and to help you keep track of your wedding's overall cost. Theme: A color scheme, theme, or motif can be carried throughout a wedding - on anything from invitations to programs to the reception menu - so make this decision early. Venues: The ceremony and reception location are major elements of your wedding and guide every other aspect of planning. As such, they should be decided upon early. Gown: Wedding dresses take a long time to be made and come into a store after being ordered. Selecting one early eliminates potential problems. Musicians: Good musicians are hard to find and many good musicians book up months in advance. Choosing one early ensures that you'll have the background music you like during your celebration. Catering: Your cake, reception menu, rehearsal menu, and day-after brunch menu can all be customized to suit your tastes. Doing this early helps the caterer or venue ensure that the proper ingredients are ordered and available to create your delectable dishes when the time comes. Choosing ceremony elements: Choose what the officiant will say and the other aspects - for example, music and readings - of your nuptials. Sending invitations: Send invitations to guests so that they have ample time to send in response cards and plan to travel. Finalizing rentals and floral: During these few months it's time to definitively choose what you want to include in your order for flowers and other rentals like linens. Purchasing accessories: Favors, cake knives, and toasting flutes are "smaller" elements of your celebration because they do not affect where the event occurs or its timeline. However, they must still be purchased well in advance to ensure that they arrive on time if you are ordering them. If you want to buy them in person, don't leave the job to the last minute; pick them up now and check another item off your list. Obtaining a marriage license: Many states require that the license be obtained no earlier than 30 days prior to the event. Therefore, the soonest you can undertake this task is one month prior to your ceremony date. Finalizing your timeline: Although you started your timeline months earlier, the final weeks and days cannot be completed until all elements of your wedding are finalized. Now is also the time to work on the itinerary for the wedding day itself. Gathering elements of your reception: Organize your guest book, wedding party gifts, and favors. They cannot be gathered and prepared to be delivered and distributed as necessary until a few days before your celebration. Creating tip envelopes: What vendors you need to tip, and how much, cannot be determined until you obtain your final bills. With careful planning, it can be easy to coordinate your perfect day. Using a wedding planning checklist can help you keep track of each small detail of your wedding to ensure that nothing is forgotten.